We would like to welcome Signal Mountain Farm's newest recipe blogger Charity Everett, founder and pastry chef at Revel Pastry Company, where she makes handcrafted, seasonally-inspired pastries and desserts. Charity says She started cooking as soon as she could stand on a chair and reach the kitchen counter. Her earliest memories center around learning from her mother and grandmother the joys of creating in the kitchen. Since then, that love of cooking has grown into a passion for baking and cooking with the seasons. At Revel, Charity creates both sweet and savory pastries inspired by the best local produce each season has to offer. At home, she draws on that same inspiration to create simple, healthy, and comforting meals. In her spare time, she is an avid thrower of dinner parties, cookbook collector, and concert goer. And Click here for more information about Revel Pastry Company Or here to follow on Instagram. These fall beauties are not to be relegated to the tabletop as decorations. They are meant to be peeled, chopped, roasted, steamed, or pureed. Though they are not related, imagine them as large carrots or beets with thick skins, if you will. Members of the winter squash family are delicious, naturally sweet, and full of dietary fiber, vitamins and minerals. If picked fresh from a green vine they would have a high starch content and less flavor. Properly "cured" winter squash is left in the field until the vines have died, the stems have dried and hardened, and the squash skins have thickened. The curing process continues after the harvest by leaving them in a dry window or counter top long enough to develop thicker, darker colored skins. In this process the starches convert to sugars and the flavors become complex. Though the naturally thick, waxy skins are sometimes difficult to remove, they serve to preserve the squash for months on end. If stored in a well-ventilated, dry place, and protected from getting cracks and bruises, they will continue to be delicious throughout the winter. Cool, but not cold storage is required, so feel free to decorate your kitchen while you are saving extras for the winter months. Click here for more information about the curing process. Some winter squash have thinner, more edible skins. Delicata squash, for example, does not generally last as long as a butternut squash or pumpkin, but the skins are lovely and soft when cooked. Although natural sugars are a highlight to winter squash, they are perfect additions to a variety of both sweet and savory dishes. There are many ways to prepare winter squash for recipes, and how you choose to prepare them may depend on the variety or the recipe. Before you begin, a couple of helpful kitchen tools to have are: 1) A sharp, good sized cooks knife or santoku knife. 2) A non-slip cutting board. Cut squash in half lengthwise. Scoop out seeds with a spoon. Brush cut sides with a little oil and place cut side up or down (up to dry the squash more, down to caramelize the edges and have a more wet puree). Bake at 400 degrees for 45 to 90 minutes or until the squash begins to shrivel and is soft when the fork is inserted. Remove from the oven and let cool. Scoop out the squash, or pull the blistered skin away from the pulp. Discard the skin. Place the squash in a blender and puree to the desired texture. Cut ends off the squash, then cut in half crosswise. With the widest cut side down, remove the skins by carefully slicing from top to bottom, working your way around the sides. When the skins are removed, scoop out the seeds and discard. Cut the squash into 1/2 inch cubes. Place the squash in a steamer basket inside a large sauce pan. Put 1-2 cups of water in the bottom of the pan and cover with a lid. Turn heat to medium-high and steam until the cubes of squash are soft. Remove from heat and let cool. Puree with a blender to the desired texture. Follow directions above for removing the squash skins. Cut into 1/2 inch cubes. Place on a baking tray or large casserole dish and coat with a little oil. Sprinkle a little kosher salt and dried spices on the squash and bake in the oven at 400 degrees for about 1 hour, or until the edges turn dark brown and caramelize a bit. This method will produce the driest result, but the most flavor. From here you can mash, puree in a blender, or simmer in another liquid like milk, juice or broth to re-hydrate before turning into a puree. Caramelizing the squash adds richness and concentrated sweetness, allowing you to reduce any added sugars (if any) to your recipes. How learning to cook, healthy lunches, and your public library can change the future. It's back to school time and many families are working out routines for getting back into the swing of school and work schedules. Preparing and packing lunches can be a chore, but also a great opportunity for teaching children about the importance of balanced nutrition. School nutrition programs are also making strides to improve in-house school meals, with more fresh fruits and vegetables being offered with lunches, farm-to-school programs, and the removal of vending machines. However, getting kids involved in making healthy choices for themselves is an essential part of changing their increasing risk for developing serious illnesses such as diabetes or heart disease. And any age is the right age to begin learning. There are many great resources for families who are interested in learning or re-learning ways to improve diets, spend time together with constructive activities, or simply get more ideas for tasty ways to enjoy fresh foods. Our favorite resource for families is Chop Chop Magazine. It is a relatively new publication from a non-profit organization, and supported by a host of foundations and the American Academy of Pediatrics. From their website: "ChopChopKids is an innovative non-profit organization whose mission is to inspire and teach kids to cook real food with their families. We believe that cooking and eating together as a family is a vital step in resolving the obesity and hunger epidemics." Here is a great article with the Library's favorites among vegetable cook books: http://chattlibrary.org/content/eat-your-veggies As our librarians like to say, "If you carrot all about what you eat, peas lettuce help you turnip these and other vegetable books. They can’t be beet." Last but not least, If you are not returning to school this week, and would like to make the most of the rest of your summer, click here for a great list of some summer-fun cook books. Try these two recipes as muffins (reduce cook time to 30-40 minutes). They can be frozen and used as a nutritious, quick addition to school lunches. In a recent edition of Chatter Magazine, food writer Beth Kirby shared stories and recipes from a few local ladies who are shaping the character of local farming. 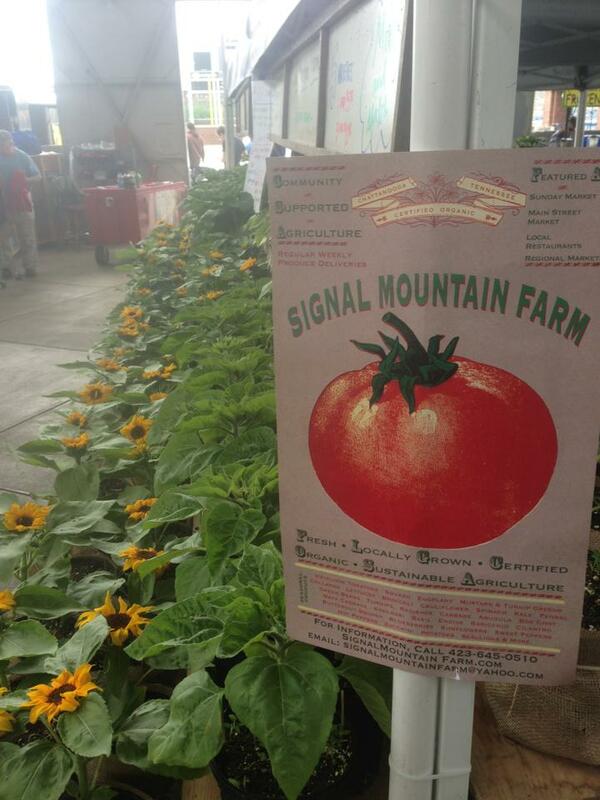 Signal Mountain Farm's McLean Miller and Chyela Rowe were part of that story. As we get ready for the first spring harvest, we wanted to share this recipe to get your mouth watering for what's to come in the 2013 CSA season. CSA members and those who have signed up for our newsletter will be receiving emails with delicious recipes tailored specifically to each week's harvest. We will post those recipes here. So come visit our website often, browse through the archives for other ideas, and feel free to share your ideas and kitchen successes on our facebook page. Trim leaves from the beets, kohlrabi, and some fennel leaf if desired. Place the leaves in a salad spinner, clean sink or large bowl. Cover with cold water, give them a swish with your hand to loosen any soil, then let rest in the cold water for a few minutes to let the soil settle. Meanwhile, wash and trim the kohlrabi, beets and fennel. Slice thinly with a sharp knife or mandolin slicer. Arrange the vegetables in an ovenproof casserole dish. You can arrange them neatly, alternating beets, kohlrabi, and fennel in a repeating pattern if you want an attractive presentation. Otherwise, just toss them all together with some oil, and season to taste with salt and pepper. Bake for about 45 minutes, or until the vegetables are tender and beginning to caramelize on the tips. While the vegetables are baking, prepare the baconage and dressing. Remove the sausage casing from the baconage with a knife or kitchen shears. Slice or crumble the baconage into a heated cast-iron skillet or heavy-bottomed skillet. Cook until browned, then remove from the pan and set aside, (but leave the drippings or fat rendered from the cooked baconage in the skillet.) Add the garlic, sorghum syrup and vinegar to the skillet. Stir until combined and cook until it begins to bubble. Remove from the heat and let rest. When the vegetables are out of the oven, remove the beet and kohlrabi greens from the cold water and spin dry or pat with a clean, absorbent cloth. Put a little oil and the greens in a large skillet and sauté until they darken in color and just begin to wilt. Add the warm vinaigrette and sauté for one minute. Season to taste with salt and pepper. Place a portion of greens on each plate, topping with baconage and crumbled blue cheese. Serve warm as a salad, or use as a topping for garlic-herbed pasta or rice. First Pickup Dates for our 2013 CSA!